Update: According to a CounterPath spokesperson, "Counterpath had to delay the launch of the Bria 3.2 update to the end of this month." CounterPath Corporation today released Bria 3.2, with enhanced enterprise features, internal chat rooms, and multiple account integration support. 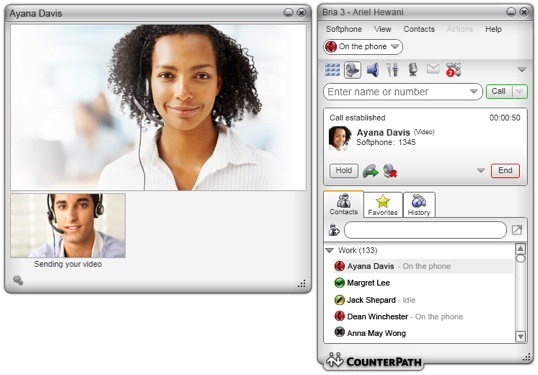 The Bria multimedia softphone is available for Mac and Windows, and adds support for multiple Instant Message and Presence accounts as well as the introduction of a Ribbon for Microsoft Outlook 2010. Bria is a highly secure, standards-based, multi-platform softphone that enables voice and high-definition video calls, making it ideal for enterprises, government agencies and other organizations that want to replace their desk phones or add unified communications functionality to their existing IP phone platform. Multiple Account Integration. Bria users can pull in and communicate with contacts from different sources and accounts, including local and company directories, Microsoft Outlook, XMPP, XCAP and WebDav servers. Contacts can be merged into a single view with all of their information from different sources in one place. Enhanced Contact Management and Display. The latest updates enable Bria users call or IM a contact with a single click, as well as expand or collapse their list to show more or less information about each contact. Ribbon for Microsoft Outlook®. Bria 3.2 includes a Ribbon for Microsoft Outlook® 2010, allowing users to place calls directly from their email accounts. The new integration features also include a contextual display of contacts in Outlook’s To-Do bar, providing quick access to Bria communications options. Company Chat Rooms. Bria now enables organizations to create their own chat rooms, providing employees and authorized external users, such as business partners, with a convenient new way to communicate, connect and collaborate. Improved User Interface. Bria 3.2 puts volume/mute controls, frequently used features and key information, such as status, all in a toolbar for convenient access. New Workgroup Management Options. Bria users now can manage workgroup functions and add or remove contacts to a workgroup directly from the contact list. I'm getting a trial of Bria 3.2 soon, so I hope to write up a review to test these new features as soon as I can. Lastly, current Bria 3.0 and 3.1 users will be automatically updated to Bria 3.2 and pricing for a single copy of Bria is $49.95.